Formed in 1991, the Revolutionary Snake Ensemble is a funk & street beat improvisational brass band performing a unique blend of original and traditional music. Leader Ken Field is a longtime member of the acclaimed modern music ensemble Birdsongs of the Mesozoic, and an active composer and performer. In addition to guest Charles Neville, the band will include Jerry Sabatini/trumpet, Ken Field/sax, Tom Hall/sax, Dave Harris/trombone & tuba, Phil Neighbors/drums, Blake Newman/bass. This Mardi Gras show will also mark the release on Accurate Records of "Live Snakes", the group's 3rd CD, and their first in over 5 years. "Live Snakes" features new and traditional material (and some remixes) from live performances in NYC and Boston in 2011 and 2013, with several prominent guest musicians. 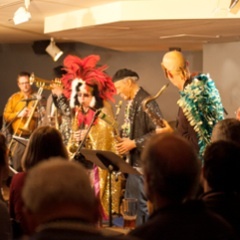 The group's previous CD, "Forked Tongue", spent 2 months on the CMJ North American jazz top 20 chart, and appeared on best-of-year lists in the Village Voice & in Estonia, plus in Georgia, Wisconsin, Kansas, Michigan, Massachusetts, Ohio, and NY. The disc features unique treatments of music by Field, Ornette Coleman, Billy Idol, and others. RSE's debut release, "Year of the Snake", includes music by Field, Sun Ra, John Scofield, James Brown, and others, and was listed as one of the top discs of the year on New York NPR affiliate WNYC, in the New Orleans Gambit Weekly, and on Radio Popolare in Milan, Italy. Born in 1938 in New Orleans, Grammy-winning saxophonist Charles Neville gained international acclaim as a member of the Neville Brothers band, the "First Family of Funk". In addition, Neville has performed with James Brown, B.B. King, Bobby Bland, Ray Charles, Allen Toussaint, James Booker, Ernie K-Doe, Wilson Pickett, Big Joe Turner, and many more, and has led his own band, Diversity, since 1991.